The Codex Wallerstein is one of the best known of the late medieval fencing treatises still in existence. Though perhaps not as widely known as Talhoffer 1467 or Flos Duellatorum, it is just as important to students of the Western martial arts. Originally written in Middle High German during the late 14th and early 15th centuries, the Codex Wallerstein has long been available to scholars in microfilm format from Augusburg University. Now with the publication of this book, the text and drawings are available to scholars and martial artists in the original Middle High German, as well as in Modern German and English translations. 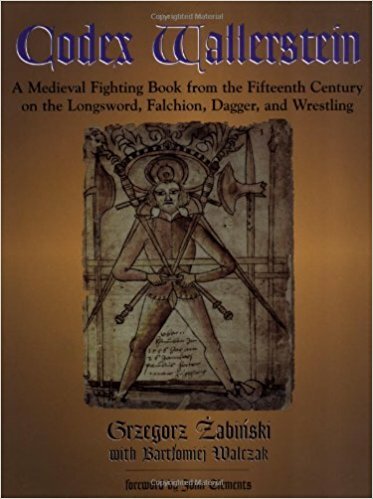 The translations were provided by Grzegorz Zabinski, with assistance from Bartlomiej Walczak, two of the most esteemed interpreters of medieval combat in the world. The codex offers a series of fundamental counters to common attacks, using the longsword, falchion and dagger, as well as the complete system of wrestling techniques. In this work the reader will find a great deal of instruction on thrusting at or closing in against an opponent, expanding Master Johannes Liechtenauer's art of longsword combat. For martial artists, medievalists, historians or anyone with an interest in historical arms or self-defense, Codex Wallerstein is sure to become an invaluable reference. It is well known that combat in the Middle Ages was bloody and pragmatic, but when it comes to interpreting just what fighters studied and practiced, we have to rely on the limited number of study guides and instructional texts that have survived. 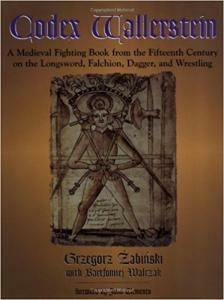 The Codex Wallerstein is one of the best known of the late medieval fencing treatises still in existence. Though perhaps not as widely known as Talhoffer 1467 or Flos Duellatorum, it is just as important to students of the Western martial arts. Originally written in Middle High German during the late 14th and early 15th centuris, the Codex Wallerstein has long been available to scholars in microfilm format from Augsburg University. Now for the first time, the text and drawings are available to scholars and martial artists in printed form in the original Middle High German, Modern German, and English translations. The translations were provided by Grzegorz Zabinski, with assistance from Bartlomiej Walczak, two of the most esteemed interpreters of medieval combat in the world. The codex offers a series of fundamental counters to common attacks, using the longsword, falchion, and dagger, as well as the complete system of wrestling techniques. In this work the reader will find a great deal of instruction on thrusting at or closing in against an opponent, expanding Master Johannes Liechtenauser's art of longsword combat. For martial artists, medievalists, historians, or others with an interest in historical arms or self-defense, this edition of the Codex Wallerstein is sure to become an invaluable reference.